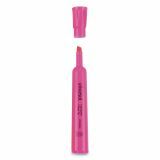 Desk Highlighter, Chisel Tip, Fluorescent Pink, Dozen - Well-designed highlighter features bright colors and wide barrel. Chisel tip allows for both broad and narrow lines. Cap holds firmly on either end of the highlighter. Bright ink will not fade and dries fast. 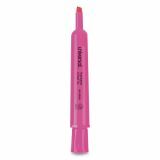 Wide barrel is easy to hold for effortless highlighting.